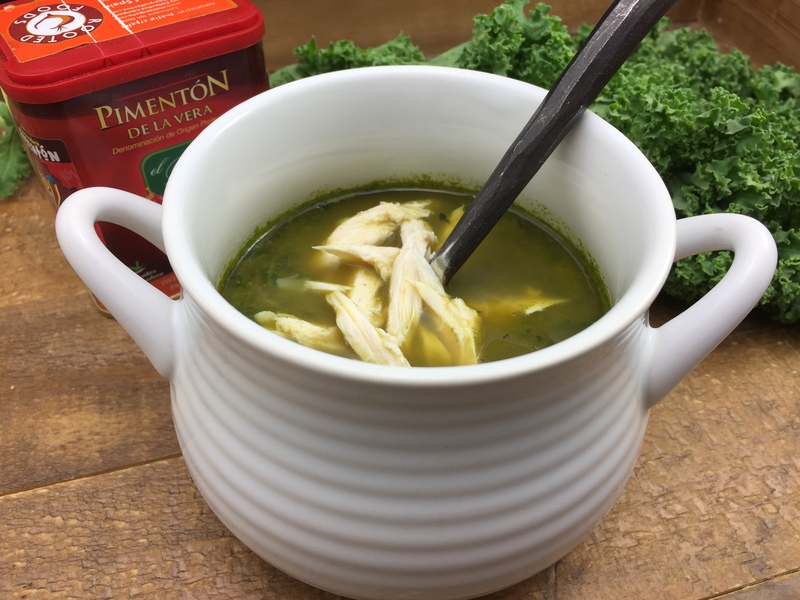 Quick, grab a stockpot – let’s make soup! We have gone from fans to furnace and a change is definitely in the air. Nothing takes the chill away like a nice bowl of something warm and this soup is really something. The ingredient list is simple, it’s easy to make, and it’s good for you. Full of greens, it’s your smoothie, but it’s warm! Caldo Verde means “green broth” in Portuguese, and this beautiful green soup is Portugal’s unofficial national dish. Chickpeas add protein and fiber – and just in case you’re still not sold – have been shown in studies to help people lose weight. I used lacinato (Tuscan) and curly kale and swiss chard, rather than the mix of kale, collard and mustard greens called for in the recipe. You can use what you have or substitute whatever kind of greens you like. Rinse your greens well and cut into large pieces. You do not need to remove the stems. The blender will do all the chopping for you and if you have any large pieces of stem left over you can simply remove them. I used Better Than Bouillon Reduced Sodium Roasted Chicken Base concentrate to make the quart of chicken stock so I did not add any salt at the end. Not wanting to make this soup spicy, I used sweet smoked paprika rather than the spicy variety. You can eat the soup as is, or according to the recipe, optionally top with 4 ounces of shredded chicken or add 2 dozen clams to the broth. I was not too excited about the clams, but I couldn’t resist topping it with a little grated Parmesan. It just felt like the right thing to do! Pour olive oil into a large stockpot and warm over medium-high heat. Add garlic and cook until golden brown, about 2 minutes. Add onions and paprika and lower heat to medium. Cook, covered, until tender, about 2 – 3 minutes. Put the greens into a blender and blend until pureed (you can use a little water to help, or use the wand tool that comes with some blenders). Pour into pot, increase heat to high, and cook until the water has evaporated from the greens. Pour two-thirds of the chickpeas into the blender with 1 cup of stock and blend until smooth. Add the pureed chickpeas to the pot with the remaining chicken stock and chickpeas and bring to a simmer. Cook covered until the greens are tender and the soup has thickened, about 10 minutes. Season to taste with salt and pepper. Ladle soup into bowls and serve.